Your family will enjoy exciting Royal Caribbean Cruises from Tampa! If your desire is to sail from this frequently visited Florida city, you have made a great choice. Tampa offers something for everyone in the family. Whether it be to watch a Tampa-based sports team in action – Tampa Bay Lightning hockey team or the NFL’s Buccaneers – learn the wonders of the sea by visiting the aquarium; walk along the path of culture at the Salvador Dali museum or enjoy the heart-stopping rides and amazing animal life at Busch Gardens, Tampa has all that and more. What’s even better is that you can board one of a handful of Royal Caribbean cruises from Tampa to popular ports of call in the Western Caribbean. Are you looking to enjoy the clear blue Caribbean Sea, interact with Spanish speaking natives or bask in the ambience of the Keys? 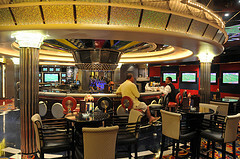 Royal Caribbean cruises from Tampa include several popular ports of call in the Western Caribbean. Shorter cruises will get you ports such as Cozumel, Mexico and Key West, Florida. Longer cruises will get you to a mixture of ports including Belize City, Cozumel, Costa Maya and Roatan, Honduras. Unfortunately, Royal Caribbean does not offer summer cruises from Tampa to the Caribbean. If you prefer a summer sailing, consider a Carnival Caribbean cruise from Tampa. 1. Brilliance of the Seas - This ship is brilliant. It is known for rock climbing, mini golf course, Broadway-style shows, 3 pools including a solarium, outdoor movie screen and Vintages, a wine bar. 2. 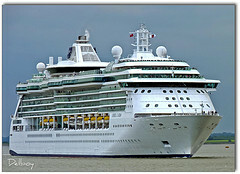 Rhapsody of the Seas - This ship is a little smaller than the Brilliance of the Seas, but it is also popular. It has 2 pools including a solarium, Chops Grille (famous steakhouse), rock-climbing, 6 whirlpools, Broadway-style shows and much more. 3. Vision of the Seas - Vision is the same size as the Rhapsody and boasts the same features. Are you ready to book your Royal Caribbean Cruise? I would. RCCL cruises are world-renowned for excellence, offering the cruising family unforgettable moments at sea. If you are ready to book, I strongly recommend checking prices at PetesTravel.com. 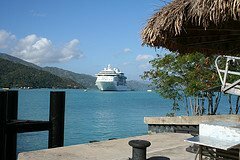 You will always find a great cruise deal, especially when you book last minute Caribbean cruises with PetesTravel. Happy Sailing with your Royal Caribbean cruise from Tampa!